I think it looks more like "The Jumper". I gave it plenty of time to proof but if my starter is indeed weak, it probably needed an even longer proofing period. I think I'll just focus on increasing the vitality of the starter, taking it out of the fridge and feeding again, with some rye or whole wheat added. Try again in a week. 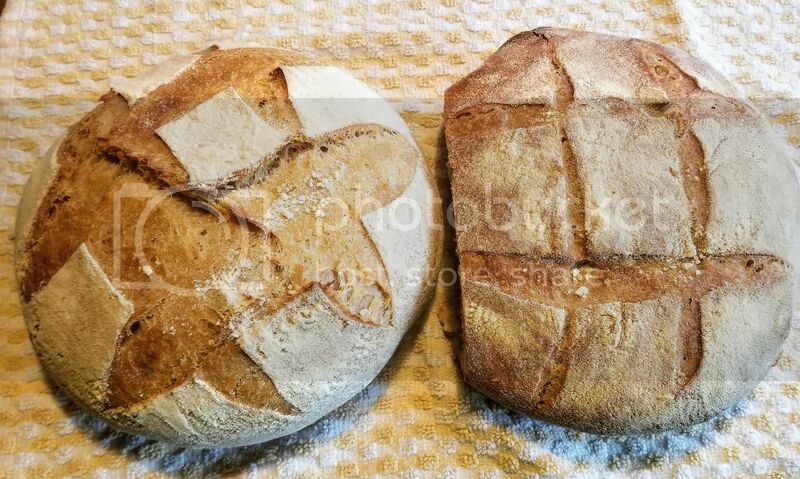 My take on underproofed vs underproofed is that underproofed loaves explode when scored- like my loaves tend to do. A "properly proofed" loaf doesn't tend to form an ear- the slash will be flat against the loaf. Overproofed loaves, like the pictorial shows, are flat and gummy. My guess, and I could be wrong, is that your loaf is overproofed. Sourdough seems to need less of a rise than i would expect before going into the oven. I'm liking having a banneton to use because it gives me a better visual as to how much the loaf has risen vs seeing it on a flat surface. So you agree with RA. Hmm. I was going by the bubbles. They are big, although irregular, just under the crust but less developed in the center. What is the difference between a banneton and a bowl? For the purpose of evaluating rise, not much. I've never used a bowl for second rise, I would just let it rise on a cookie sheet, under a piece of saran wrap because my house is so dry. Now I have the banneton, and after I got over my fear that I hadn't conditioned it enough to prevent sticking, I like it. I’ll look for a good basket to serve. I’ll also look for razor blades. You don’t use a scale, right? I both do and do not use a scale, it depends on the recipe. My first loaf tastes great and has a nice crust and ok texture but it didnt rise much. Fun first go though! Well, I pulled my starter out of the fridge & fed it about 3 hours ago and it has maybe quadrupled in size in that time. I was worried my starter wasn't strong enough but I think it's just that I used it after it had peaked. So, I am waiting for it to peak and then I will try again. But, given how vigorous it is today, I have high hopes! Whoa! That’s impressive. I’ve been tracking mine for the last couple of days and it barely doubles in eight hours. Well, I started another batch which includes a 30 minute autolyse and THEN I read that you should not autolyse with rye because something about rye. So-- I might have already screwed up batch 2 also. We'll see. Nooo, I don't think you screwed it up. How did it turn out? Not great. Ok. But nothing to write home about. I have another loaf proofing right now. I am struggling with the loaf formation. And, I guess I need a baton. I think after this next loaf of failed sadness I may take a little break. The struggle is real. Donovan seems happy as ever though. Mistakes that teach... I tried to adapt the sponge recipe to one I would retard. As far as ratios of fat/liquid/carbs these are almost identical, but one I used very warm liquid in the sponge, the other cold. The warm one started rising sooner, of course, and both were put in the fridge at the same time. The warm one didn't stop during the night, I pulled the slower one out at 4am to try to speed it up. Result? One slightly underproofed, the other totally overproofed. The overproofed one even rose/baked more quickly. Still tastes OK, but it ain't pretty! And RA. Yes, the struggle is real. Ok, that lowf was fugly but it worked. I started down this road thinking I could make sandwich rolls that would last more than a day. I feel like I'm a ways from that still. I don't think you're that far off. Try the sponge recipe, don't use more than 1/3 whole grain flour, shape into rolls and see how it goes?